The video shows how to combine some software to get and visualize more information from your HFDL monitoring. HFDL is a data mode, intensively used between air and ground. You can receive these data and decode it with e.g. PC-HFDL software. These data maybe automatically streamed to software PC-HFDL-Display. It takes up to six sources and displays all information neatly in a spread-sheet style. If you click on the Flight Number in the resulting spread-sheet, website flightradar24 opens up and shows the complete route of this flight, together with many other data. Note, that not each and every Flight Number is listed on the flightradar24 page. This page relies mainly on position reports on the ADS-B network, transmitted on 1,090 GHz with a range of rarely more than 400 km. Out of this range, HFDL steps in. 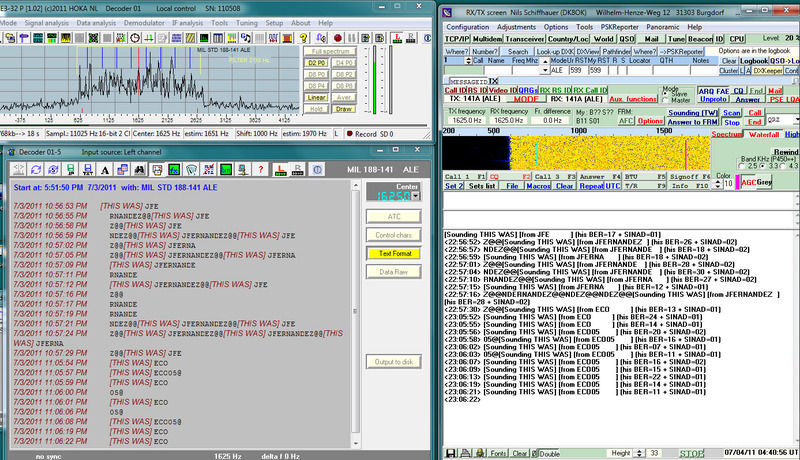 ADS-B plus HFDL is a charming combination as is the two software and the web service presented in the above video. Click HD button at bottom right there (“Enable HD Quality”) to get the best quality. HOKA’s Code3-32P is a truly professional decoder in a price class which will fit into most hobby budgets. Together with Roland Proesch’s Frequency Manager it makes an even stronger companion (with your Perseus SDR) in decoding and analyzing many digimodes. This paper is an introduction into this decoder. It’s written in German, but 17 illustrations plus Google’s Translator will help you. Nach wie vor ist der Code3-32P von HOKA ein starker Decoder und ein zuverlässiges Analysewerkzeug für Digimodes zu einem verhältnismäßig kleinen Preis. Zusammen mit dem Frequency Manager von Roland Proesch bildet er ein nochmals stärkeres Gespann (dann gemeinsam mit dem Perseus SDR). With “Signals Analyzer”, the late Russian expert Sergey developed an excellent software to analyze digital signals. There still is no better software around to do this job at a budget price. Signals Analyzer – Step by Step provides a short introduction in using this software with audio recordings. It is a basic version of a German paper of 28 pages which you will find here. Thanks to its 65 and mostly self-explaining screenshots, it will make an interesting reading also for people who don’t speak “The Awful German Language” (Mark Twain, 1880). Click here to download this enlarged Version. Google Translate also offers a great help in reading it. Here you find a link to the software and to additional information. Antonio is one of the most avid users of this software and provides many examples on how to use it on this page.